Are you on your smartphone right now? If you answered yes that’s because the age of mobile content viewing is now. If you answered no, and you own a smart phone, we can venture a guess that you either have or it won’t be long until you start engaging with content on your mobile device. We have seen a huge jump in the number of mobile browsers on our site in this past year. We’re not saying people aren’t checking out your website on their laptop or desktop screens - because they are - we’re just saying more people are looking at it on their smart phones and their tablets than you may think. In 2013, mobile traffic almost doubled and it's only been increasing this year! What's most interesting about mobile traffic is that these users are not just browsing, they are researching and making purchases directly from their devices, and yes, that includes SaaS products, not just hard goods. There is an intention behind the use of their mobile. What does that mean for all of you who are selling software as a service? It’s time to revamp (or rethink) your content to accommodate this new age by making a few small changes. 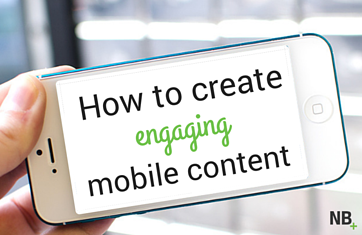 If you want to be able to effectively capture your mobile traffic, you need to ensure that your content is digestible and formatted appropriately to be viewed on other devices. Mobile content is most often viewed on the go, which means the attention span of your reader is dramatically shortened. Between sipping their morning coffee, text messages from their boss and catching that 8am meeting, you don’t have much time to catch their attention. In order to capture the attention of your persona and keep them coming back for more, it’s essential that your mobile content is engaging and retainable. Let’s stop preaching and get to work. There’s definitely an art to mastering your marketing strategy and the same rings true for your mobile content. When you're ready to take the plunge into optimizing your website to capture your mobile visitors, consider these 10 lessons to ensure you're making the most of it. Lesson 1: Content must be easily digestible and to the point. Mobile readers are often doing two things at once or are in a distracting environment, like a coffee shop or a public park, so it’s important that they are getting the information they are looking for immediately. Lesson 2: Utilize responsive design to ensure that your content is being formatted correctly no matter what device it is being viewed on. Not only does it make it easier for readers to browse your website but mobile compliant websites rank higher in search (especially when searches are conducted from a mobile device) giving your content even more reach. Lesson 3: Ensure your page has a very fast load time, and by fast we mean (ideally) less than 1 second! Properly formatting your images so they are a small size and 72 dpi will greatly speed up how long your page takes to load. Lesson 4: Static can be better. Animated GIFs can be hard to view and videos often take a long time to load. If you do leverage video, make sure it's set to click-to-play rather than play by default. This is a great way to decrease the load time. Lesson 5: Less is more. Consolidate the steps needed to get your offers, to check out via shopping cart or to log in. Every unnecessary step it takes means you are increasing the risk of losing a potential customer. Lesson 6: Keep in mind that mobile devices have small screens and even though your mobile content should be optimized to look good on whatever screen it’s viewed on - think about the sizes of your images, logos, etc. too. You don't want your logo to take over the screen because it's not formatted correctly. Lesson 8: Make sure your CTAs are clear, concise and large enough to see. Not only do you want to be sure your readers know what they are going to get when they click on your CTAs, but you also want to make sure they are visible and easy to click on. Lesson 9: Use large buttons to be sure your readers don’t have to zoom in on your page to browse your content. Lesson 10: Write captivating, informative titles because when viewed on mobile devices it's likely the title will be the main thing they see when they visit your website. Make sure you're capturing their attention immediately so you have a better chance to convert them once they've read the content. Let’s take a second to think about the content on your website that your customers and prospects find valuable. Many SaaS companies offer things like user manuals, tutorial guides, training material, etc. These are pieces of content that could be easily turned into a mobile-optimized, interactive ebook to make them more visually appealing, fresh, and easily consumed from mobile. Check out these apps and templates that can help you get started. Need some inspiration? Think about the content you typically view on your mobile device and consider what makes it different from what you choose to view on your laptop or computer. What is it about certain mobile content that compels you to keep reading and what do you close out of almost immediately? Make a list and brainstorm how you can integrate these ideas into your own strategy. And of course, if you're still not sure what to try and what will work, run an A/B test and see what types of content convert your mobile traffic better. Look at metrics like bounce rate, clicks, length of time spent on the page, etc., to get a true idea of how those users are engaging (or not) with your content.